Next month’s wake-up call was preprogrammed into New Horizons’ on-board computer in August, commanding it come out of hibernation at 3 p.m. EST on Dec. 6. About 90 minutes later New Horizons will transmit word to Earth that it’s in “active” mode; those signals, even traveling at light speed, will need four hours and 25 minutes to reach home. Confirmation should reach the mission operations team at APL around 9:30 p.m. EST. At the time New Horizons will be more than 2.9 billion miles from Earth, and just 162 million miles – less than twice the distance between Earth and the sun – from Pluto. After several days of collecting navigation-tracking data, downloading and analyzing the cruise science and spacecraft housekeeping data stored on New Horizons’ digital recorders, the mission team will begin activities that include conducting final tests on the spacecraft’s science instruments and operating systems, and building and testing the computer-command sequences that will guide New Horizons through its flight to and reconnaissance of the Pluto system. Tops on the mission’s science list are characterizing the global geology and topography of Pluto and its large moon Charon, mapping their surface compositions and temperatures, examining Pluto’s atmospheric composition and structure, studying Pluto’s smaller moons and searching for new moons and rings. New Horizons team members will give an overview of pre-Pluto preparations, as well as the science plans for the Pluto encounter, on Thursday, Nov. 13, at the American Astronomical Society Division for Planetary Sciences (DPS) meeting in Tucson, Ariz. The 90-minute briefing starts at noon (MST) and will be posted shortly afterward on the DPS meeting site. New Horizons’ seven-instrument science payload, developed under direction of Southwest Research Institute, includes advanced imaging infrared and ultraviolet spectrometers, a compact multicolor camera, a high-resolution telescopic camera, two powerful particle spectrometers, a space-dust detector (designed and built by students at the University of Colorado) and two radio science experiments. The entire spacecraft, drawing electricity from a single radioisotope thermoelectric generator, operates on less power than a pair of 100-watt light bulbs. Distant observations of the Pluto system begin Jan. 15 and will continue until late July 2015; closest approach to Pluto is July 14. The Johns Hopkins Applied Physics Laboratory manages the New Horizons mission for NASA’s Science Mission Directorate. Alan Stern, of the Southwest Research Institute (SwRI) is the principal investigator and leads the mission; SwRI leads the science team, payload operations, and encounter science planning. 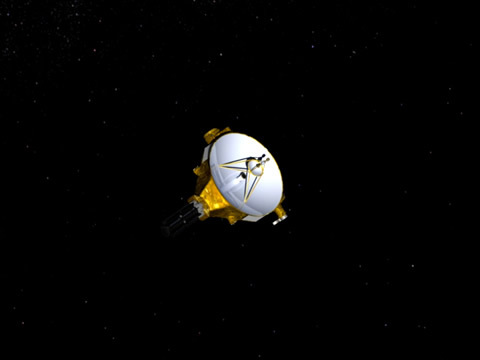 New Horizons is part of the New Frontiers Program managed by NASA's Marshall Space Flight Center in Huntsville, Ala. APL designed, built and operates the New Horizons spacecraft.